There's so much anticipation. Because this year. You know what to expect. You've been there before. Now the cat is out of the bag. No longer the great unknown that is Black Rock City but now a familiar return…home. It's interesting returning to a place that is so utterly unique that the mere thought of existing on the playa makes the heart race and butterflies to the stomach. the obvious assumption is that, while there will be some similarities, each year will be it's own experience. the playa doesn't take, it gives. it gives us what we need. Whether we like it or not. This particular year I thought I would have a game plan. Sure. Why not try and actually 'plan' something on the playa. See more art. Do more. But then you're on a plane, flying back to your default world 'home' and wondering to yourself how the hell was that a week. Where did it go? What did I do? How can I do this better? Maybe better isn't the word to use. Because everything is perfect. But different. Which means in essence we are practicing. This was a fun realization at our camp this year. Every year we return to practice again. Try something different. Whatever that means. But given that we only have a short 7 days to get it 'right'…means we'll most likely have to keep practicing until we get it 'right'. For me, I don't want to ever get it right and of course I am very well aware that this is impossible, but the chance to spend 7 days every year around such an incredible group of individuals gets me excited to try it again. 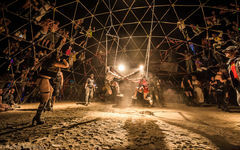 Artistically there is a constant battle between radical participation (one of the tenants of Burning Man) and documentation as a photographer. Of course there is the pure physical aspect of caring 20+lbs of backpack and then the elements, but more of trying to capture a gathering such as Burning Man, and not be repetitive. Not wanting to copy myself from year 1. And returning after the playa I honestly felt that I did not shoot as much as the first year. That the photographs were lacking perhaps. And now I look down and the "best of" seems more extensive than I could have imagined. What that means, I leave up to you.